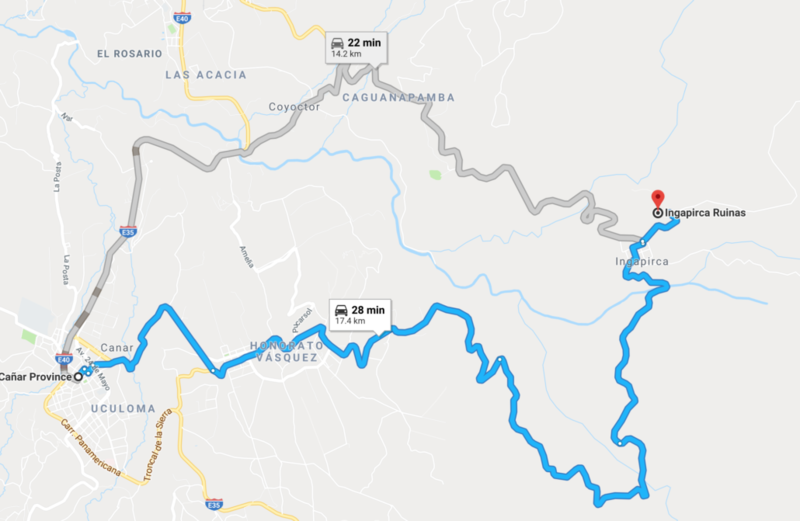 This is Part 3 in our 3-part series from an excursion we took with Flavio from Polylepis Tours northeast of Cuenca, Ecuador to Biblián, Cañar and Ingapirca. 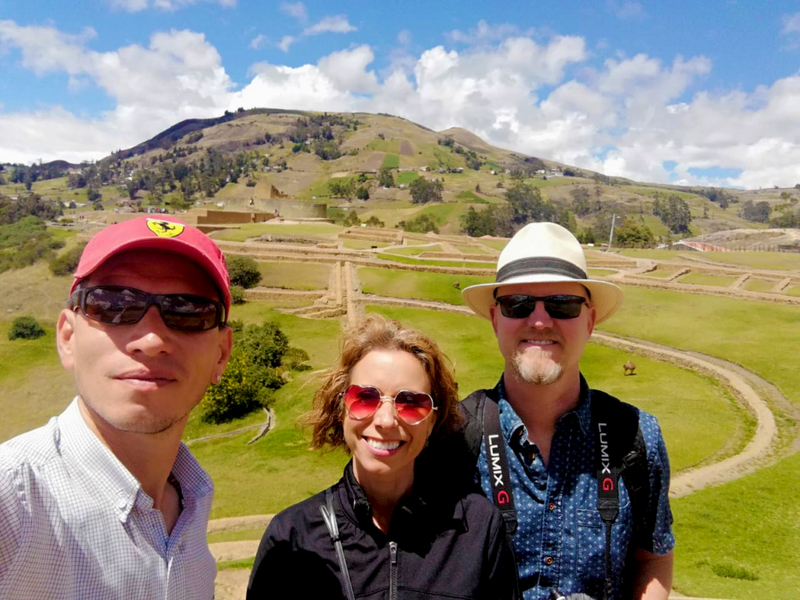 Our third stop was in Ingapirca, Ecuador. The drive from Cuenca to Biblián, then to Cañar, then to Ingapirca and finally back to Cuenca was stunningly beautiful. 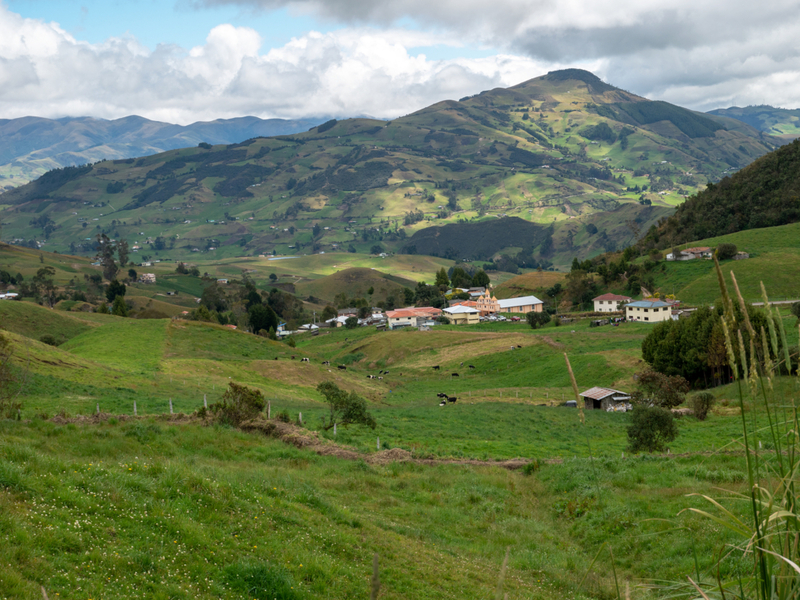 The Ecuadorian countryside is lush and green with rolling mountains and blue skies with white billowy clouds. The old adobe houses with tile roofs dotting the green pastures made us feel like we stepped back in time. The houses in the picture below are much newer and larger. Flavio told us that a lot of people who live in this area have family who immigrated to the United States 30 or 40 years ago, but still send money back to their families here in Ecuador. They use the money to build big houses. Ingapirca is an important archaeological site in Ecuador. It’s considered the second largest Inca ruins in South America, second only to Machu Picchu. In reality, it’s a combination of Cañari and Inca ruins. 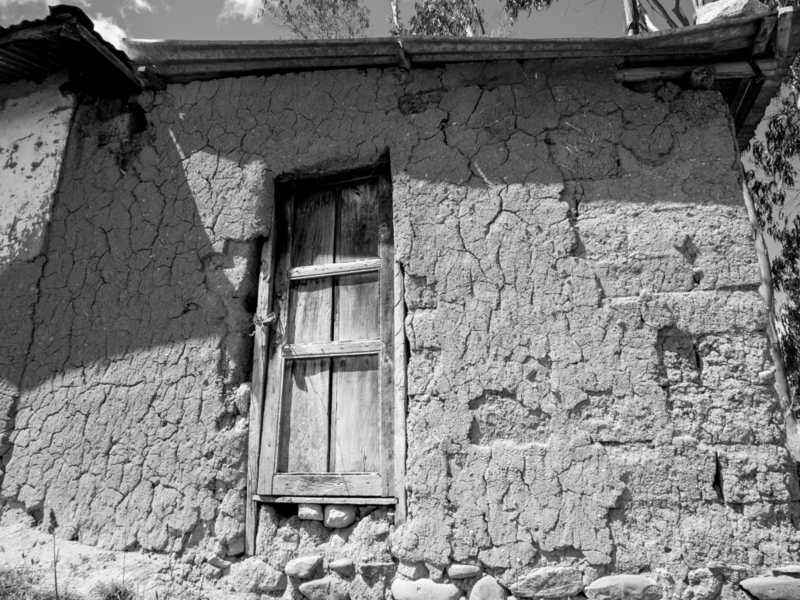 The Cañari people have been living here for nearly 1500 years and the Inca only arrived a little over 500 years ago. El Templo del Sol or the Temple of the Sun (shown below) was built on top of the Cañari infrastructure. You might notice in this picture and in the video that there is no safety wall or railing on the temple. One wrong step and it’s a straight drop of more than 50 feet to certain death on the rocks below. In Ecuador, you’re responsible for your own safety. The state doesn’t spend much money on railings. 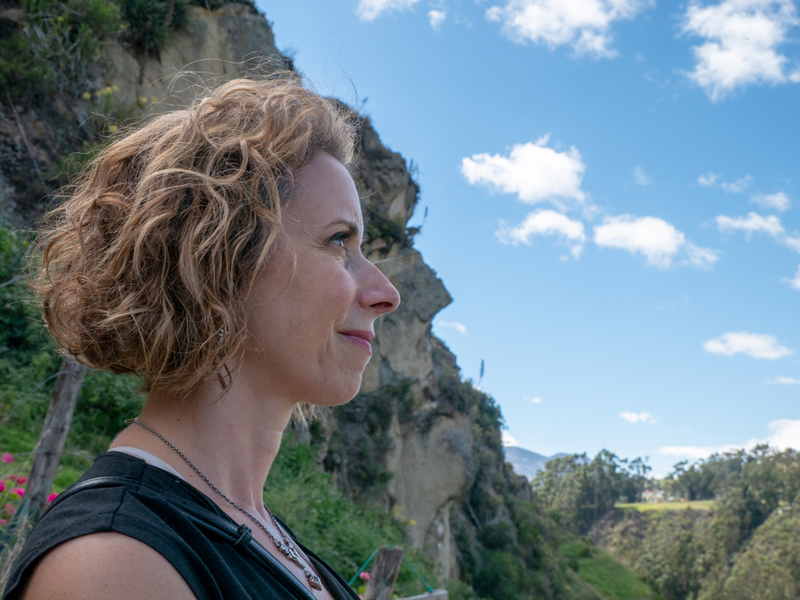 After wandering around the ruins and learning all about their history from Flavio, we walked along a narrow dirt trail for about a half mile to La Cara del Inca or the Face of the Inca. This is a rock formation that the looks like a face. 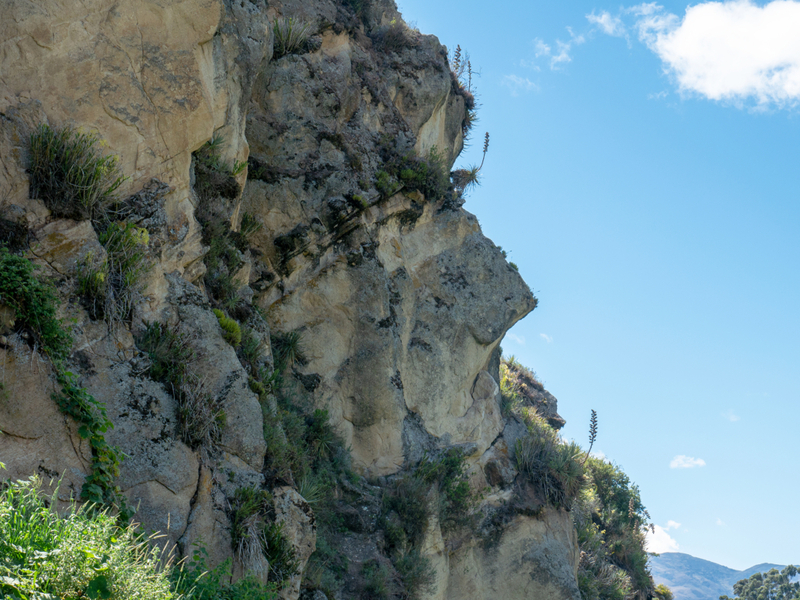 It’s common for people to pose for pictures with the Inca “face” in the background. You may have noticed this house in the video. 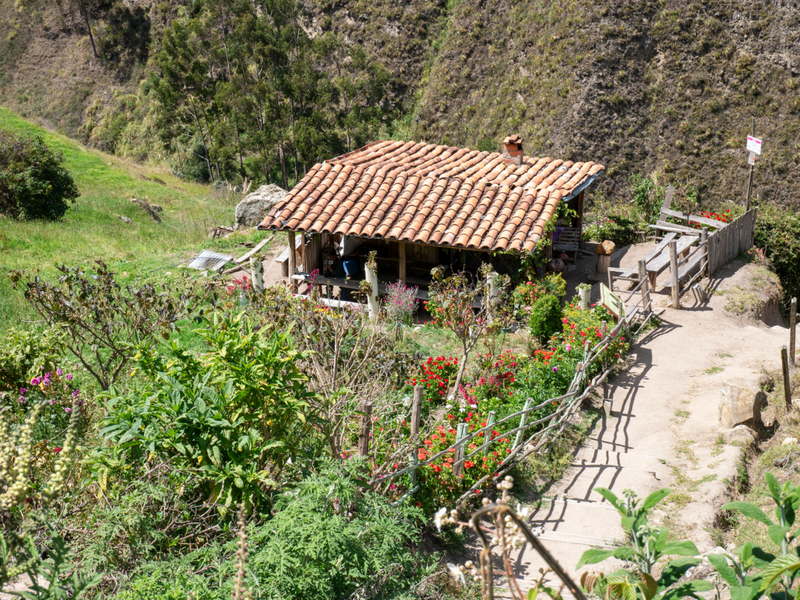 It’s located below La Cara del Inca and from our observation, the long walk along the dirt trail is the only access to this house. There is an indigenous woman standing on the porch looking up at all the tourists and behind her house is a long drop to the river below, which is probably where she gets her water. You’ll notice there are no power lines running to her house so she likely has no electricity. This is a slice out of history. Here’s another slice out of history. I took this photo in black and white to make it more realistic. You may have noticed lots of llamas in the video. They roam freely around the Ingapirca ruins. In Ecuador, they’re nature’s lawnmowers. We thoroughly enjoyed our full-day tour with Flavio and Christian from Polylepis Tours. Flavio even arranged for us to have a vegan lunch at one of the restaurants at Ingapirca. If you’re in Cuenca and need a great tour guide, we can’t say enough good things about Polylepis Tours. Abroad and this is Amelia, mi media naranja. JP: That’s “my better half” in español. Mi media naranja. JP: or middle orange. A: But ok, I’ll take it. JP: Anyway. JP: This is part 3 in our three-part series to Biblián, Cañar and Ingapirca. 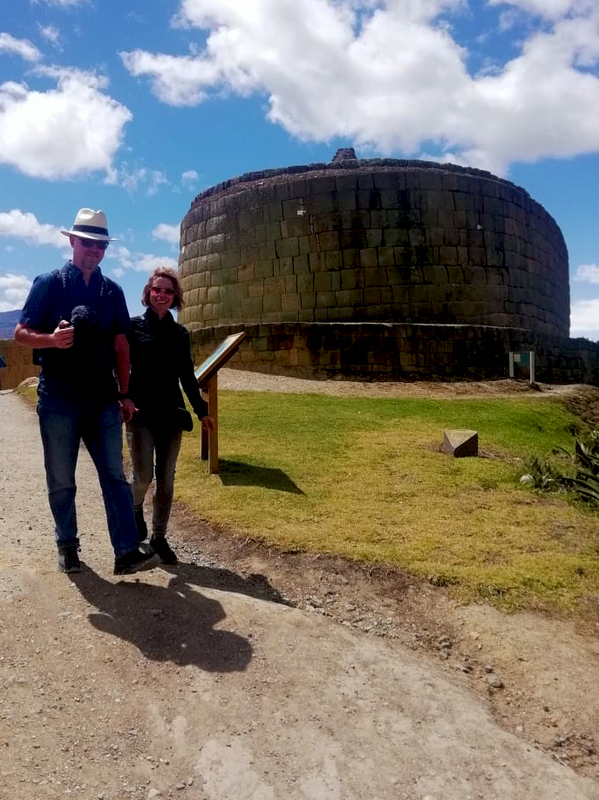 And in this video it’s all about Ingapirca, which are the Incan ruins that are just northeast of Cuenca. A: Yeah it was incredible. the experience as much as we did. JP: It was really cool. to engage with us online give us a shout out. JP: Or anything about the video. JP: We’ll be happy to answer your questions. because we also have some cooking videos coming up and we’ll see you soon. Flavio: OK my friends. Firstly, welcome to Ingapirca archaeological site. F: It’s considered the second important in South America. You know Machu Picchu. First one more important and Ingapirca is the most important for us in Ecuador. the Cañari culture. They call it Hatun Cañar. And then the Incas come to here to re-found it with the name Ingapirca. F: The Incas Wall. Ingapirca means Incas Wall. F: Now we walk around an hour twenty minutes more or less and then come back. Ok? Here extract scopolamine. It’s a hallucinogen plant. It’s a drug. Oh it is? F: They call it the Trompeta de Angel. A: They’re all over the place. The Incas use it to connect with the motherland, the Pachamama the different gods. like a 10 or 12 youngest like offers or sacrifices. F: Now all the rest stay in the museum. It’s like a ceremonial bath. Outside from here it was a meeting point for the Cañaries or the Incas. When they have, for example, the sun festivals, June, July the solstice. F: Temple, the people walking here and take a little bath like a purification. A: Then they go up to the temple. F: These are ceremonial baths. F: Construction was an important a different to Peru. F: Have a big like avenues. Cañaries used, the Inca, sorry, used these kind of canals. F: To avoid the floated the water to destroy the road. A: They were very smart. F: Really really smart. It is an aqueduct. F: Yeah, it is an aqueduct. the ruins of Ingapirca. It is amazing. shaped like bricks are from the Inca. The llamas are looking very chillax today it is a perfect day to relax up here. A: Yeah it looks like one on top like they built on top of the Cañari. the Incas room and here is call it aguila wasi. like a virgin or chosen, yeah, the chosen. F: But probably they serve is all they would yeah. Serve, cooking, cleaning and probably sexual. F: 12, 15 girls here. is the right word they used it for ceremonies. some people say it’s nature. JP: Wow I hope you enjoyed that footage as much as we enjoyed recording it. through the country there and going back. JP: Yeah, the countryside was just incredible. of a postcard. It doesn’t seem real, but, it is. right on top of the Cañari infrastructure there. stones so they were more square. so little we really know. A: I think it’s really cool. I hope you guys liked it. Ingapirca so we were pretty happy with him for that. 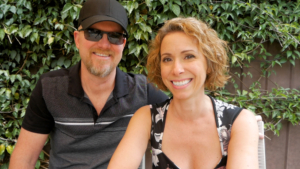 JP: We were starving by the time we got to lunch. A: We did of course have our backup PB&J’s. A: But they were not needed. JP: We didn’t eat them. latest and greatest. And we will see you soon for our next set of adventures. and what’s amazing is that you can see the cloud forest in the background. the clouds hanging below the mountaintops. So cool. 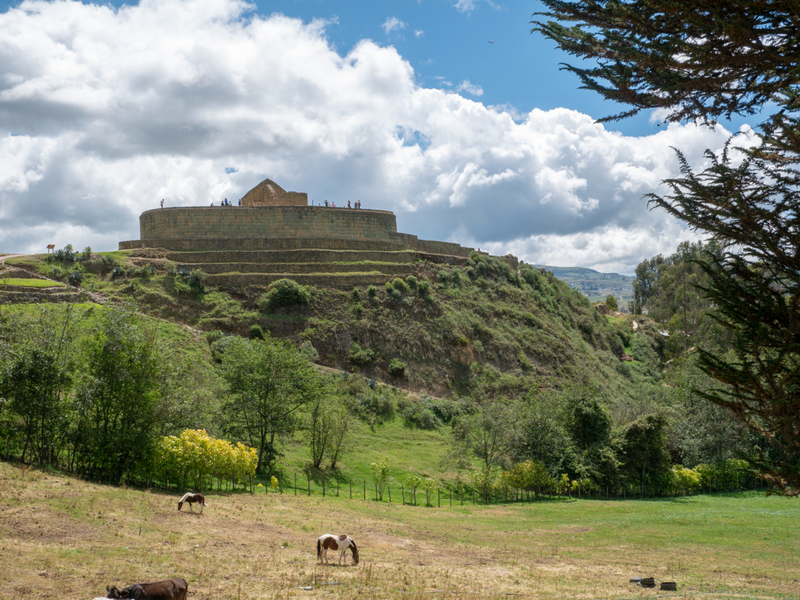 The Pumapungo Inca Ruins in Cuenca, Ecuador is one of Amelia’s favorite places to visit. 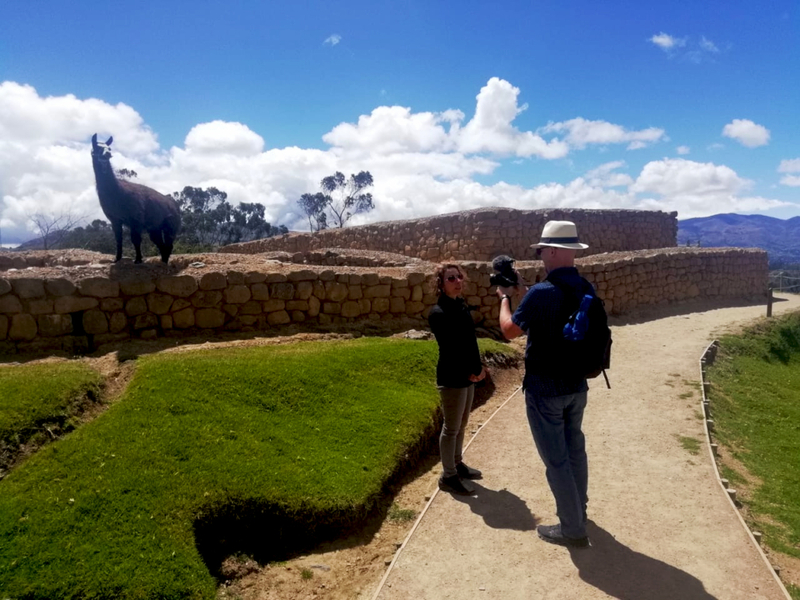 We both love walking around the beautifully landscaped grounds, learning about the Incan history. Entry is free and it’s very peaceful and relaxing. On the day we filmed this video, it was so windy that my microphone didn’t work well so most of the audio was unusable. Instead of an Inca history lesson, you get to enjoy the beauty of Pumapungo with some relaxing music.